Nukina Kaioku was an archetypal Nanga artist of the late Edo period. In addition to his accomplishments as a poet, calligrapher and painter in the Chinese literati style, he also wrote theses on painting and calligraphy theory, and he founded the Shuseidō Academy for Chinese Confucian studies in 1828. He modeled his paintings after the literati artists of the Yuan period (1279–1368), who were known for their atmospheric landscapes and for their respect of art-historical traditions. In Viewing Plum Blossoms in Snow, Kaioku adheres to the most prevalent imagery in Chinese literati painting, that of an individual’s solitary journey through a landscape. The artist uses the blue, green, and gold colors to articulate the sculptural forms of the rocks. This intentionally archaic choice of colors can be traced back to paintings from the early Tang dynasty (618–907) and to their revival during the Yuan dynasty by artists such as Zhao Mengfu (1254–1322). The painting shows a single gentleman traveling through a winter landscape. The mountains loom over him. Washes of ink define the calm water on either side of the traveler, and the sky, with a similar gray tonality, frames the mountains in the far distance. The soft pink hues of the plum blossoms enliven the predominately gray vista. 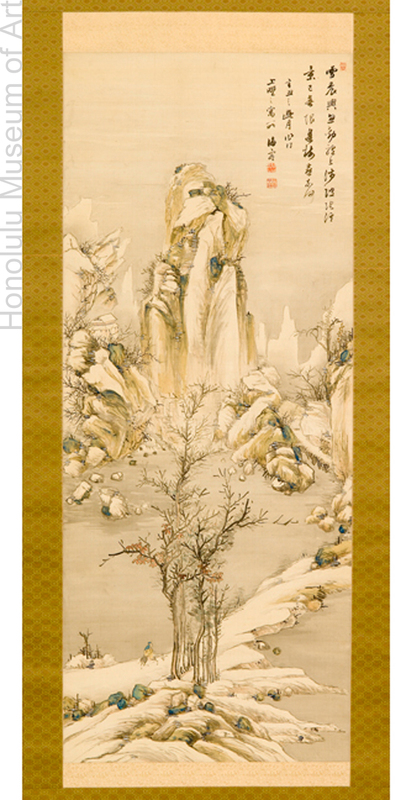 The subject of plum blossoms in winter was a popular one amongst both Chinese and Japanese literati painters. The blossoms are revered for their ability to bloom despite the winter snow. Their fragrance pervades the air at the coldest time of the year, thus they symbolize perseverance and hope.